Our last editorials focused on the external and internal security challenges the European Union is facing, the new geostrategic landscape it finds itself in, and the attempts to use the momentum and create a more coordinated approach to European defence. Security challenges are however not the only defiance Europe is facing. With national elections coming up in a number of European countries the rising influence of populist and euro-sceptic parties may not be underestimated. “For a Europe of unity against divisions and new walls. A delegation of the EUROMIL Board and Presidium will join the March. As umbrella organisation of European military associations and trade unions, EUROMIL strongly believes that it is high time for Europe to focus on social affairs. 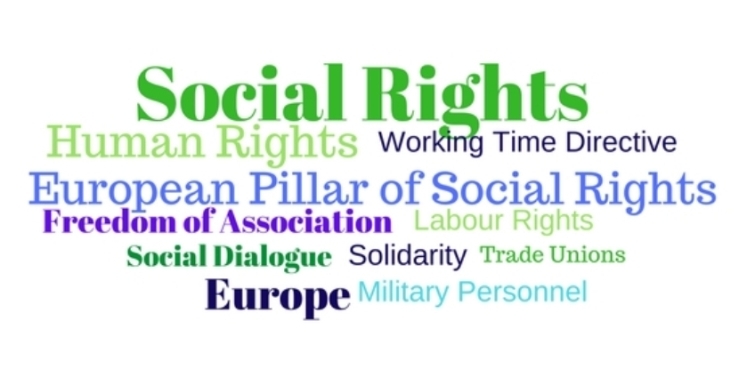 In recent months, the European Commission worked on the European Pillar of Social Rights – to be presented in March – which is to be accompanied by an interpretative communication on the EU Working Time Directive. In the area of occupational safety and health, the better protection of workers from the risks related to exposure to carcinogens or mutagens at work is on the table. Social standards need to lead to upward convergence in the whole European Union, the scope of the Pillar should therefore not be narrowed down to the Eurozone. Social dialogue and involvement of workers: At EU level, the necessary legislative regulations are already in place. What is missing is the effective monitoring of the implementation at national level. In a high number of European countries military personnel is still excluded from the fundamental right to freedom of association. Moreover, trade union rights including the right of collective bargaining for military personnel are only implemented in a small number of European countries. Furthermore, EUROMIL explained the need for a comprehensive implementation of the EU Working Time Directive in a letter to the EU Commissioner Marianne Thyssen, who is in charge of drafting the interpretative communication on the matter. In the months to come, we expect from the EU to deliver clear and comprehensive and clear standards of social and labour rights in the European Union. National governments need to implement the regulations timely and effectively for all workers, including military personnel. Ameliorating the working conditions in Europe might not be the only step needed to convince citizens of the importance of European unity, but it certainly is an important one.